Skerries Soundwaves Festival Committee is probably our busiest committee right now, with just a week to go to the festival launch in Skerries Mills! When you read this, and if you are living in Skerries, you may already have received the brochures – if not, they will arrive very soon, and you can also pick them up in many Skerries shops and of course in Skerries Tourist and Town Information Centre, Thomas Hand Street, which is their ticket office this year (open Wed to Sun, 10.30 a.m. to 5 p.m.). For the first time in a few years, tickets are also available through the Soundwaves website. However, for many of the events that won’t even be necessary, as they are free – the Opening Night (Fri 19 Sep), the Soundwaves Lego, Minecraft and Cookery Competitions & Exhibitions (Sun 21 Sep), the Céilí, the Street Party, the Classical Oasis and the Night Parade & Fireworks (all Sun 21 Sep) for instance don’t need any booking or entrance fee – just turn up and be part of our festival! Over the years, a number of events have become firm favourites, such as the classical concert in Holmpatrick Church, the poetry event, the Lego Workshops (as this goes public, there are still some tickets left, but don’t wait too long! ), the puppet shows, and of course the biggest event of them all – the Gig at Skerries Mills Courtyard. 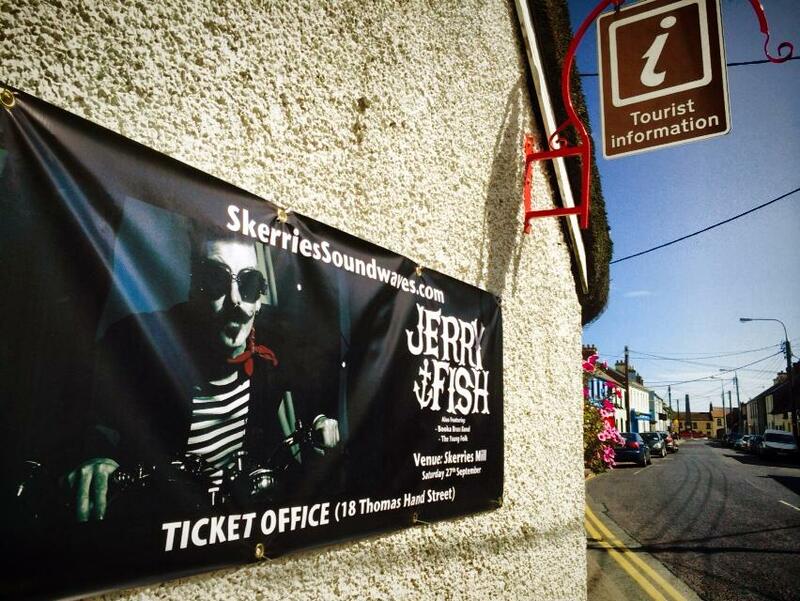 where impressive impresario Dave Diebold (of Skerries News & Skerries Tourist Office) will present you Jerry Fish & Band, the Booka Brass Band, and The Young Folk. A night not to be missed – and the VIP tickets are all gone already! Skerries Soundwaves have their own mini-Fringe, too: First off are the competitors in the Skerries Got Talent Auditions who are competing for a place in the Matinee / Final on Sat 20 September. Then it’s the competition for the U2s and Hothouse Flowers of tomorrow (am I betraying my age by selecting those bands as examples? ), Battle of the Bands: Little Theatre, Fri 12 Sep. And for the fans of Minecraft, there will be a party on Saturday to celebrate the launch of this year’s Soundwaves Minecraft Project 2014 – unfortunately, word spread fast about this one, and all 50 tickets are now gone. However, the project itself (now in its third year) has many spaces left, so all Skerries Minecrafters are invited to join online to create a virtual Skerries! And then the festival proper kicks off with the abovementioned opening night and all its other highlights – too many to mention here, so seek out the brochure, visit our website, and look out for your Skerries Community Association Newsflash! To keep up with what is happening, visit skerriessoundwaves.com and follow the Soundwaves Festival crew on Facebook. The Soundwaves Festival could not happen without volunteers who join the team for an event or two… here is a list of those where we are currently short of a few “Yellow Shirts.” If you’re interested, please contact our Volunteer Manager, Nathasha – she’ll be delighted to hear from you! You’ll be helping the Event Manager with running the event smoothly, checking tickets, helping people with questions, and giving a hand in general. We’re particularly looking for people who could help out during the Gig at the Mills, the Street Party (including four strong people for setting up the marquee), and the Night Parade. This entry was posted in Events, News by SMcK. Bookmark the permalink.